Home » What is coverage? Programme coverage is one of the most useful and reliable indicators for measuring the performance of CMAM programmes. The effectiveness of CMAM programme and the coverage it achieves are strongly linked. An effective CMAM programme will tend to achieve good coverage and a programme with good coverage is expected to be an effective programme. Maximizing coverage therefore is likely to improve effectiveness and met need: Even for a programme that is achieving good clinical outcomes (high cure rates and low death rates), ultimate impact is diminished if it only achieves low levels of coverage (as shown in figure 1). ASSESSING BARRIERS Information on bottlenecks to coverage can be gained independently of coverage assessment methodologies, through routine data analysis or qualitative data analysis. Bottlenecks can appear at various levels of service provision, ranging across 4 broad categories of enabling environment, supply, demand and quality. These categories are based on the Tanahashi model of coverage2, which identifies the relationship between the target population and service achievement. Below are two methods for collecting this type of information. 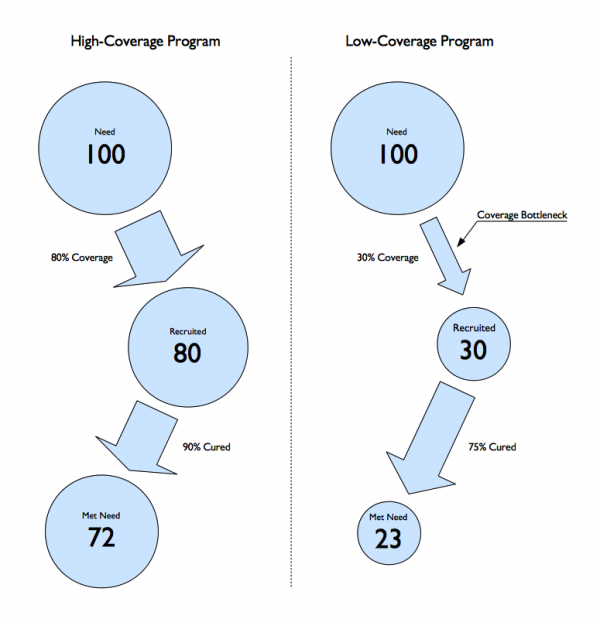 Collecting routine data as per the Tanahashi model of the determinants of coverage can help identify, in a structured and logical manner, bottlenecks to effective coverage. This analysis should be carried out on a regular basis using routine data and qualitative stakeholder discussion. Qualitative information is key to understanding the profile of the community, to understanding health seeking behaviour, communication channels. This activity fits within a SQUEAC assessment but can be carried out independently if a coverage estimate is not needed.